The Beer and Health booklet has been translated into Dutch. This is the first translation of the booklet. More will follow. All translation will be posted on this website. 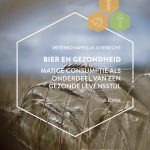 “Bier en Gezondheid: Matige consumptie als onderdeel van een gezonde levensstijl” was produced by the Dutch Beer Institute. The Dutch version can be obtained in clicking here.